Many homeowners want hard surface flooring instead of carpet. And they will often present a prescription from their doctor for a hard wood floor in an effort to get around their association’s restrictions or prohibitions on hard surface flooring. Yes, a prescription for a hard wood floor on a doctor’s prescription form. But anyone that works with condos knows that hard surface flooring may create nuisance problems for the downstairs neighbor. And when the downstairs neighbor complains to the board about the hard surface floor that was not approved and violates the CC&Rs, the board is sometimes reluctant to take legal action thinking that a court is not going to rule in its favor. 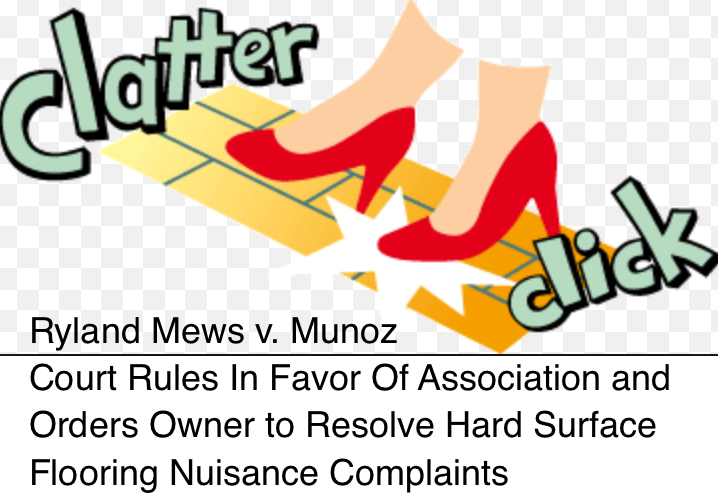 The California Court of Appeal debunked that thinking in the case of Ryland Mews v. Munoz upholding a California condominium association’s ability to limit hard surface flooring in response to nuisance complaints. The story in the Ryland Mews case is all too familiar. Munoz moved into their upstairs unit at Ryland Mews and replaced the carpets with hardwood floors allegedly to accommodate the wife’s severe dust allergy. And it was not to soon after that when the downstairs neighbors complained about the additional noise they were now hearing. When the association’s manager wrote to Munoz regarding the complaints and the fact that the alteration of the flooring was made without prior approval of the association, Munoz did not respond within the 30 days Management had given them. Management wrote to Munoz again, this time requesting Alternative Dispute Resolution (ADR) under the Davis-Stirling Act. Munoz still did not respond to the Association’s Request for Resolution. After Munoz failed to respond to 2 letters from the association, one a Request for Resolution offering mediation, the Association, having no choice, filed a lawsuit seeking a court order requiring that the flooring be removed. Munoz opposed the injunction motion, claiming, that’s right, you guessed it, that hardwood floors were necessary because of the wife’s alleged allergies to dust. The association’s request for a preliminary injunction was granted requiring an interim solution, that throw rugs be placed on 80 percent of the floors outside the kitchen and bath areas. Really pleased to see this from the court as it validates the approach we have taken for years and dealing with hard surface nuisance flooring. Munoz to remedy the unauthorized flooring in order to reduce the transmission of noise to the unit below. Munoz appealed the decision. The Court of Appeal reviewed the Association’s CC&Rs, which provided that “no activity shall be conducted in any Unit or Common Area that constitutes a nuisance or unreasonably interferes with the use or quiet enjoyment of the occupants of any other Condominium” as well as another section that stated that no unit “shall be altered in any manner that would increase sound transmission to any adjoining or other Unit, including, but not limited to, the replacement or modification of any flooring or floor covering that increases sound transmissions to any lower Unit.” In addition, the CC&Rs required prior written approval before any “replacement or modification to any floor coverings . . . if the replacement or modification, penetration or disturbance could result in any increase in the sound transmissions from the Unit to any other Unit.” Ryland Mews did have a lot of sections of the association’s CC&Rs that were helpful to support it’s case. It is important to consider the factors California Court of Appeal indicated must be taken into consideration to support an association’s request for an injunction: a court must weigh two “interrelated” factors: (1) the likelihood that the moving party will ultimately prevail on the merits and (2) the relative interim harm to the parties from issuance or non-issuance of the injunction. The Court of Appeal upheld the finding that Munoz’s violation of the Association’s CC&Rs had resulted in a continuing “great nuisance” for the occupants below and was supported by substantial evidence and that the directive from the lower court ordering Munoz to find a compromise in modifying the flooring, as well as the interim remedy of using throw rugs throughout 80% of the unit, reflected a balanced consideration of the circumstances of everyone involved, including the residents below who were adversely affected by Munoz’s violation of the noise and nuisance restrictions. The ruling of the trial court requiring that Munoz cover 80% of the wood flooring with area rugs is an interesting result as that is how many of these cases are resolved. The problem with this approach is the fact that area rugs without padding may not be sufficient to adequately limit the noise level. This case addresses several important issues for managers and board members. First, it helps them understand when court’s are likely to grant injunctions. Second, the case addressed the issue of compliance with the Code required Request for Resolution. Munoz complained that the association did not provide all of the required documents; the court felt that there had been substantial compliance. Better to fully comply and not face this issue. When in doubt, consult with legal counsel. Third, make sure to highlight the restrictions on hard surface flooring in the rules and reference the sections of the CC&Rs. Consider the adoption of guidelines as to what an owner can do to get approval for hard surface flooring if possible. If the CC&Rs say, as they did in this case, that no owner can increase the level of sound that is transmitted to the downstairs unit, make that clear. Finally, the allergy excuse. The fact that the court did not consider the wife’s allergies is telling. Perhaps the result would be different if there was a letter from a doctor. But the fact that the upstairs neighbor may have a disability does not mean that they can create a nuisance for the neighbor below. The fact is that there are options other than hardwood flooring to accommodate resident’s allergy problem and it may not be a reasonable accommodation to cause a nuisance for the neighbor below. This case tells us that the courts are going to support an association’s effort to eliminate a nuisance hard surface floor that is causing a nuisance for the unit resident below, assuming that the association is properly enforcing the restriction in the CC&Rs and is not acting discriminatorily or arbitrarily.